“Chin Wing You Affidavit Photo,“ 1907, Chinese Exclusion Act case files, RG 85, National Archives-Seattle, Chin Wing You case file, Seattle Box 822, file 7030/13441. Chin Wing You 陳榮耀 was born in Seattle, Washington in 1887. His parents Chin Gem (Jim) Wah and Me Wing Wah, had two older sons, Chin Wing Moy and Chin Ah Wing 陳阿榮 who were also born in Seattle. The family traveled to their family village Hing Lung Lay, Sun Ning district, China in 1888. The father made several trips between China and Seattle between 1888 and 1907. His son Chin Ah Wing joined him at the Wa Chong Company in 1900. His son Chin Wing Moy died in in China in 1907. Chin Wing You 陳榮耀 married Louie See in China in 1905 then prepared to join his father in Seattle in 1907. Since he was in China when the Exclusion Act was passed, he did not have a residence certificate. 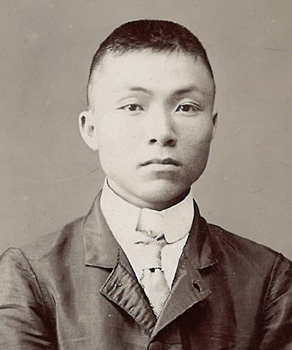 He did not have the required documentation to prove that he was born in the U.S. and was the son of a merchant, so he was required to have witnesses swear that he was the son of Chin Jim Wah and was born in Seattle. Samuel L. Crawford, was a witness for Chin Wing You in 1907. His affidavit stated that he had been a resident of Seattle for thirty years; he knew Chin Wing You’s father, Chin Jim Wah, prior to 1887; Chin Jim Wah was a merchant, partner and bookkeeper for the Wa Chong Company; he and his wife lived in the store and had several small children. In Crawford’s interrogation he stated that he was in real estate business. From 1875 to 1888 he was in the newspaper profession with the Post Intelligencer. He knew and had dealings with all the Chinese businessmen. He was acquainted with Chin Ching Hock, Woo Gen, Wan Lee, Chin Gee Hee, and Ah Wah. Crawford saw Chin Jim Wah, Wa Chong Company’s bookkeeper, every month when he conducted business with the store. Crawford identified photos of Chin Jim Wah and Chin Ah Wing. Chin Ah Wing, marriage name Chin Hui Quock, a U.S. Citizen and resident of Seattle, swore in a 1907 affidavit that he was born in Seattle on 1 October 1885 and his brother, Chin Wing You, was born at the Wa Chong Company store in Seattle on 10 May 1887. Chin Ah Wing left Seattle in 1888 and returned in 1900. He made another trip to China in 1904 and returned the next year through Port Townsend. In George Harman’s 1907 affidavit he swore that he was a citizen of the United States and a resident of Seattle and Kitsap County for 56 years; that Chin Wing You was born in Seattle at the Wa Chong Company on the corner of South Third and Washington Streets where the Phoenix Hotel was standing in 1907; and that the family went to China in 1888 when Chin Wing You was about one year old. In Harman’s interrogation he testified that he had been in Washington state since 22 August 1866 when he “got paid off in the navy yard from the navy.” In 1907 he was living on a ranch about twelve miles south of Seattle. He was asked what he was doing in Seattle five years before the 1889 fire. He replied that he had been working in various places in the woods hauling out wood. He knew the Chinese at Wa Chong Company especially the manager, Chin Ching Hock, who at one time was a cook in a logging camp. Chin Ching Hock’s wife and Harman’s wife were sisters. Chin Ching Hock’s second wife was Chinese, and their children were born in Seattle. When asked if he had been a witness for other Chinese, Harman said he was only a witness for his nephews, the sons of Chin Ching Hock and his sister-in-law. The interrogator disagreed and told him that he had affidavits showing that Harman had been a witness for Woo Ah Moy in 1901 and Chin Ah Wing in 1900. After considering the evidence from the applicant and the witnesses, John H. Sargent, Immigration Inspector in Charge, ordered that Chin Wing You be admitted to the United States as a returning native-born American citizen on 19 November 1907. Chin Wing You made another trip to China in 1912. When he returned, he had no proof of citizenship, so he produced a duplicate of his 1907 admittance into the Port of Seattle as an American-born Chinese. With this information he received his certificate of identity #45476. He made trips back to China in 1922, 1929 and 1941 and sired many children.